ICI 182,780 (ICI) belongs to a new class of antiestrogens developed to be pure estrogen antagonists and, in addition to its therapeutic use, it has been used to knock-out estrogen and estrogen receptor (ER) actions in several mammalian species. In the present study, the effects and mechanism of action of ICI were investigated in the teleost fish, sea bream (Sparus auratus). Three independent in vivo experiments were performed in which mature male tilapia (Oreochromis mossambicus) or sea bream received intra-peritoneal implants containing estradiol-17 beta (E2), ICI or a combination of both compounds. The effects of E2 and ICI on plasma calcium levels were measured and hepatic and testicular gene expression of the three ER subtypes, ER alpha, ER beta a and ER beta b, and the estrogen-responsive genes, vitellogenin II and choriogenin L, were analyzed by semi-quantitative RT-PCR in sea bream. E2 treatment caused an increase in calcium levels in tilapia, while ICI alone had no noticeable effect, as expected. However, pretreatment with ICI synergistically potentiated the effect of E2 on plasma calcium in both species. ICI mimicked some E2 actions in gene expression in sea bream liver upregulating ER alpha, vitellogenin II and choriogenin L, although, unlike E2, it did not downregulate ER beta a and ER beta b. In contrast, no effects of E2 or ICI alone were detected in the expression of ERs in testis, while vitellogenin II and choriogenin L were upregulated by E2 but not ICI. Finally, pretreatment with ICI had a synergistic effect on the hepatic E2 down-regulation of ER beta b, but apparently blocked the ER alpha up-regulation by E2. These results demonstrate that ICI has agonistic effects on several typical estrogenic responses in fish, but its actions are tissue-specific. The mechanisms for the ICI agonistic activity are still unknown; although the ICI induced up-regulation of ER alpha mRNA could be one of the factors contributing to the cellular response. Most estrogen actions are mediated by specific nuclear estrogen receptors (ERs), which classically regulate transcription by binding as dimers to specific estrogen-response elements (ERE) found in promoters of estrogen-responsive genes (ERGs) . This transcriptional activity is dependent on conformational changes of the ERs two activation functions (AF): the N-terminal (ligand-independent) AF-1 and the C-terminal (ligand-dependent) AF-2, which function independently or synergistically to recruit and interact with coregulator (coactivator or corepressor) proteins leading to changes in the rate of gene transcription . Two ER subtypes (α and β) are present in most vertebrates, although in teleost fish one ERα and two ERβ genes (βa and βb) have been identified [e.g. [3–5]]. There is also substantial evidence that estrogens also function via non-classical mechanisms . These include indirect transcriptional activation through interaction of ligand-bound ER with other transcription factors, ER ligand-independent activation in response to intracellular signaling cascades, and rapid non-genomic actions initiated at the plasma membrane. However, it is not clear if these are mediated by a subset of nuclear ERs that localize to the plasma membrane, or by novel membrane receptors unrelated to ER or through both [1, 6, 7]. ERs are known to accept a wide range of ligands, including natural estrogens, synthetic estrogens or antiestrogens, phytoestrogens and a variety of xenoestrogens . While many behave as estrogen agonists, other compounds may act either as agonists or antagonists depending on the species, tissue, promoter or ER subtype (the selective ER modulators, SERMs; e.g. tamoxifen) . The tissue-selective effects of SERMs have been exploited to develop new drugs for the treatment of estrogen-related diseases, although some have unwanted side effects or generate resistance to treatment, in part due to their agonist effects in some tissues . ICI 182,780 (trade names Faslodex, Fluvestrant) belongs to a new class of antiestrogens developed to have no agonistic effects, and besides its therapeutic potential demonstrated in clinical trials, it has been used as an alternative and efficient means to "knock-out" ER effects in studies of estrogen functions, and to establish the contribution of nuclear ERs to particular estrogen actions [11–14]. In mammals, ICI 182,780 appears to act at several levels to block estrogen actions [reviewed by [11, 15]], but little is known about its effects and mechanisms of action in fish. ICI blocked E2-induced interstitial cell proliferation in immature rainbow trout (Oncorhynchus mykiss) testis  and the production of zona radiata proteins and vitellogenin in Atlantic salmon (Salmo salar) hepatocytes  and of vitellogenin in channel catfish (Ictalurus punctatus)  and Siberian sturgeon (Acipenser baerii)  hepatocytes. Agonistic actions have been identified in Atlantic croaker (Micropogonias undulatus), in which both estradiol-17β (E2) and ICI decreased gonadotropin-stimulated 11-ketotestosterone production in testicular fragments in vitro, although these rapid effects appeared to be mediated by interaction with membrane-bound receptors [20, 21]. The objective of this study was to investigate the effects and mechanisms of action of ICI 182,780 (ICI) on several typical in vivo estrogenic responses in the teleost fish sea bream (Sparus auratus), in order to evaluate the potential of ICI as an agent to knock-out estrogen effects in fish. 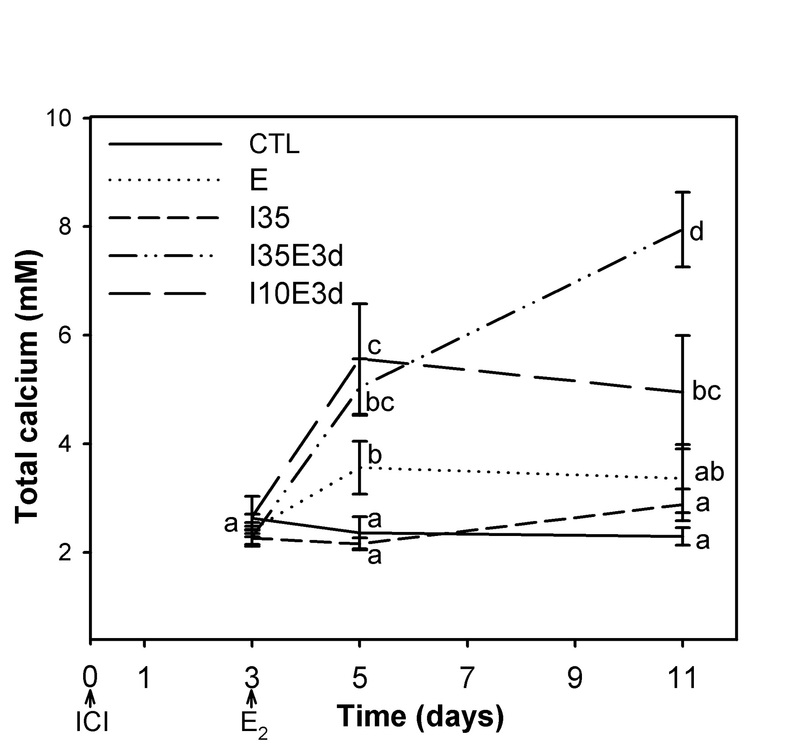 In a preliminary experiment with the more readily available tilapia (Oreochromis mossambicus) we established that ICI potentiated the calciotropic effect of E2 [22–24]. The effects of E2 and ICI on plasma calcium and on hepatic and testicular gene expression of the three ER subtypes and the estrogen-responsive genes vitellogenin II and choriogenin L (egg yolk and eggshell precursors, respectively) were then analyzed in sea bream, for which these molecular markers were available [5, 25]. All animal maintenance and handling procedures were carried out in compliance with the recommendations of the Association of Animal Behavior . Adult tilapia were obtained from a stock raised from fertilized eggs at the University of Algarve, Faro, Portugal, and maintained in 150L closed circuit freshwater aquaria at a water temperature of 24°C and 12L:12D (light-dark) photoperiod. Adult sea bream were obtained from TIMAR Cultura de Águas (Olhão, Portugal) and maintained at the University of Algarve in through-flow 500L seawater tanks with a water temperature of 17–21°C, 36‰ salinity and 12L:12D photoperiod. At least one weak before the start of each experiment, fish were randomly distributed between different tanks (one per treatment) and left to acclimatize during this period. Three independent experiments were performed (see additional file 1 for a representation of the experimental design of the three experiments), in which anaesthetized tilapia or sea bream (2-phenoxyethanol, Sigma-Aldrich, Madrid, Spain, diluted 1:10,000 in seawater) received intra-peritoneal (i.p.) implants of coconut oil (200 μl/100 g body weight, Sigma-Aldrich) containing different doses of E2 (Sigma-Aldrich) and/or of ICI 182,780 (Tocris, Cookson Ltd, Bristol, UK). Fish were returned to their tanks and left undisturbed during the experimental period (1–11 days), during which they were fed daily at the normal rate. The first experiment, with male tilapia, was designed to test the broad effects of ICI on plasma calcium, the concentration of which typically increases in response to estrogen [23, 24]. Tilapia was chosen because we can easily obtain reproductively mature individuals all year round. The experiment was carried out in June/July with five groups, each composed of five sexually mature male tilapia (body weight 45.9 ± 3.6 g). The effect of ICI alone compared to control fish was tested in two groups in which i.p. implants of coconut oil containing 35 mg/kg body weight (bw) (I35 group) or the vehicle coconut oil alone (CTL, control group) were administered. Since it was expected that ICI would act as an E2 antagonist, we hypothesized that pre-treatment with ICI should inhibit the response to E2 including a lower calciotropic response to E2. To test this hypothesis three further groups of fish were pre-treated with either coconut oil vehicle, 35 mg/kg bw ICI or 10 mg/kg bw ICI in coconut oil, followed 3 days later by 10 mg/kg bw E2 in coconut oil (groups E, I35E3d and I10E3d, respectively). The CTL and I35 groups were also injected at this time with coconut oil alone. At each sampling point (days 3, 5 and 11), fish were anesthetized and blood samples collected from the caudal vein with heparinized (150 U/ml ammonium heparin, Sigma-Aldrich) 1 ml syringes. Plasma samples were obtained by centrifugation of whole blood (10,000 rpm for 5 min) and were stored at -20°C until the determination of plasma calcium levels. Since the tilapia experiment demonstrated a significant agonistic effect of ICI, we have carried out an experiment in sea bream (sea bream experiment 1, see additional file 1 for a representation of the experimental design) to compare the gene expression in response to ICI or E2 at the dosage levels used in tilapia. The sea bream was chosen because we have available a range of molecular markers for estrogen responsive genes [5, 25]. The experiment was carried out in September, at the beginning of spermiation, with three groups of eight mature male sea bream (body weight 367.1 ± 8.9 g) which received i.p. implants of coconut oil containing 10 mg/kg bw E2 (E group), 10 mg/kg bw ICI (I group) or coconut oil alone (CTL, control group). Twenty eight hours later, fish were over-anesthetized in 1:5,000 2-phenoxyethanol:seawater, killed by decapitation and transverse sections of testis and liver were collected, snap frozen in liquid nitrogen and stored at -80°C for subsequent RNA extraction. In the third experiment, carried out in November (sea bream experiment 2, see additional file 1 for a representation of the experimental design), we set out to examine the effect of lower, more physiologically relevant, dosages of ICI and E2, separately or in combination, on plasma calcium and gene expression in sea bream. For that purpose six groups of eight mature spermiating male sea bream (body weight 239.2 ± 3.3 g) were injected with the vehicle (coconut oil) in the first day, except for group IE3d which was injected with 4 mg/kg bw ICI in coconut oil. After three days, fish were injected with coconut oil implants containing 1 mg/kg bw E2 (E1 group), 0.1 mg/kg bw E2 (E0.1 group), 4 mg/kg bw ICI (I group), 4 mg/kg bw ICI plus 1 mg/kg bw E2 (IE group) or 1 mg/kg bw E2 (administrated to the IE3d group, injected with ICI in the first day), while the control group (CTL) was injected with coconut oil alone. Forty eight hours later, blood was collected and plasma samples recovered as described above and stored at -20°C until used for determination of calcium and E2 (see below). Fish were killed by decapitation and transverse sections of liver and testis sampled, frozen in liquid nitrogen and stored at -80°C for subsequent RNA extraction. Total plasma calcium (bound plus free) was measured in duplicate in 10 μl plasma samples from individual fish using a colorimetric assay (Calcium kit, procedure no.587, Sigma-Aldrich). E2 was quantified in individual plasma samples by radioimmunoassay using specific antiserum (Research Diagnostics, Flanders, New Jersey, USA) as described in Guerreiro et al. . The cross-reaction of E2 antisera with ICI was approximately 20% in the middle of the linear portion of the standard curve but there was no parallelism with the standard curve of the assay. Total RNA from male sea bream liver or testis was extracted from frozen tissues using TRI Reagent (Sigma-Aldrich) and cDNA was reverse transcribed from 4 μg of total RNA using random primers and M-MLV reverse transcriptase (Invitrogen, Carlsbad, CA, USA) in a 30 μl reaction. The mRNA expression of sea bream ERs, vitellogenin II (VgII), choriogenin L (ChgL) and the internal control gene coding for 18S ribosomal RNA (18S) was analyzed by semi-quantitative RT-PCR using the same reaction conditions, primers and annealing temperatures previously described by Pinto et al. [5, 25]. These parameters are represented in Table 1, together with the cycle numbers optimized for the detection of each gene in the exponential phase of amplification for each experiment/tissue analyzed in this study. No genomic DNA or cross-annealing with genes from the same family was detected with these primers [5, 25]. Band intensities of RT-PCR products were quantified by densitometry as previously described  and relative expression values calculated as base ten logarithms of the expression ratios between each gene and 18S. Gene name abbreviation and accession number, primer sequence (forward and reverse, respectively), amplicon length (bp), annealing temperature (Ta) and optimized cycle numbers (N) for liver (Liv) or testis (Tes) cDNAs from Experiments (Exp) 1 and 2. Plasma calcium concentrations in the tilapia time-course experiment were log transformed and analyzed by two-way repeated-measures ANOVA, followed by a post-hoc Tukey test for pairwise multiple comparison. Calcium and E2 concentrations and semi-quantitative RT-PCR data (all log transformed) in the sea bream experiments were analyzed by one-way ANOVA followed by the Tukey test. Pearson correlations of expression levels among genes were calculated and probabilities determined with Bonferroni corrections. The software used in the analysis was SigmaStat v.3.00 (SPSS Inc, Chicago, USA). Data is presented as mean ± standard error of the mean and statistical significance was established at P < 0.05. As expected, after 2 days of E2 treatment tilapia plasma calcium levels increased to almost twice those of the controls (Figure 1). In contrast, there were no statistically significant differences in calcium levels between control and ICI only-treated tilapia. However, ICI-pretreatment at the two doses tested strongly potentiated the effect of E2 on calcium causing a highly significant ~2 fold increase within two days and a further ~1.5 fold increase in the next 6 days with the highest ICI dose (I35E3d). Time-course of total calcium plasma response in tilapia. Adult male tilapia received coconut oil implants with different combinations of estradiol (E2) and of the antiestrogen ICI 182,780 (ICI). Times of injection are represented by arrows on the lower panel. CTL = control group, coconut oil only; E = 10 mg/kg body weight E2; I35 = 35 mg/kg ICI; I35E3d and I10E3d = 10 mg/kg E2 injected three days after injection with 35 or 10 mg/kg ICI, respectively. Blood samples were collected 3, 5 and 11 days after the first injection. Different letters indicate statistically significant differences (P < 0.05) among treatments and sampling times, evaluated by two-way repeated-measures ANOVA using log10 of calcium plasma levels. Since in the first experiment conducted in tilapia 10 and 35 mg ICI provoked a rise in calcium of similar magnitude after three days of E2 exposure, 10 mg/kg ICI and 10 mg/kg E2 treatments were used to investigate their short-term effects (28 h) on gene expression in sea bream. 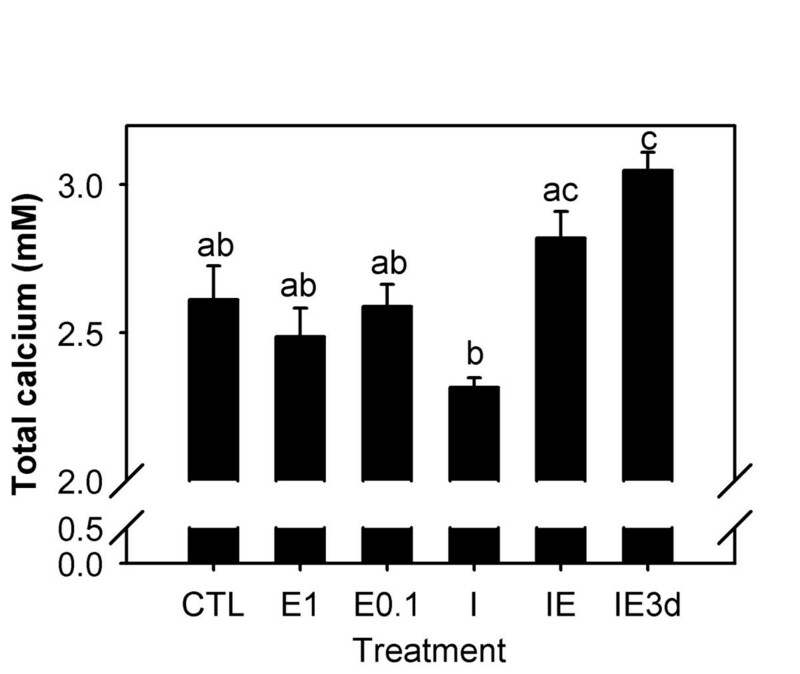 As expected, E2 treatment caused a significant up-regulation in expression of ERα (approx. 4-fold), VgII (6-fold) and ChgL (11-fold) in liver (Figure 2A). In contrast the mRNA levels of both ERβ subtypes significantly decreased approx. 10-fold compared to the control group. Interestingly, treatment with ICI also caused a significant up-regulation in ERα, VgII and ChgL, which was of the same magnitude to that of E2 treatment in the case of ERα but significantly less in the case of VgII and ChgL (1.8- and 2.5-fold increase, respectively, compared to control). ICI treatment had no effect on the expression of ERβa or βb. Strong positive Pearson correlations were found between the ERα, VgII and ChL responses to E2 and ICI in this tissue (Pearson coefficient 0.658–0.939, P < 0.01), but not between ERβa and ERβb. Gene expression in E 2 -treated (high dose) sea bream. Sea bream males received coconut oil implants with 10 mg/kg body weight E2 (E), 10 mg/kg ICI (I) or coconut oil alone (CTL) for 28 h. Liver (A and C) and testis (B and D) were analyzed for gene expression of estrogen receptors (ERα, ERβa, ERβb) and estrogen-responsive genes, vitellogenin (VgII) and choriogenin (ChgL) by semi-quantitative RT-PCR. Each bar (A and B) is the mean ± S.E.M. of the relative expression values (target gene/18S) of eight fish. Different letters indicate statistically significant differences between treatments (general linear model using log10 of the relative expression values, P < 0.05). The gel images (C and D) are representative RT-PCR products for each experimental group. In the testis, no statistically significant changes in gene expression were obtained for any of the ER subtypes (Figure 2B), while the expression levels of both VgII and ChgL were increased by E2 but remained unaltered by ICI treatment. In contrast to what was observed in the liver, ERα was positively correlated with ERβa (Pearson coefficient 0.640, P < 0.05) but not with VgII and ChgL, which were highly correlated among them (0.853, P < 0.001). As for calcium levels, no significant difference was detected between control fish and E2 at any dosage, ICI alone or the simultaneous treatment with E2 and ICI (Figure 3). 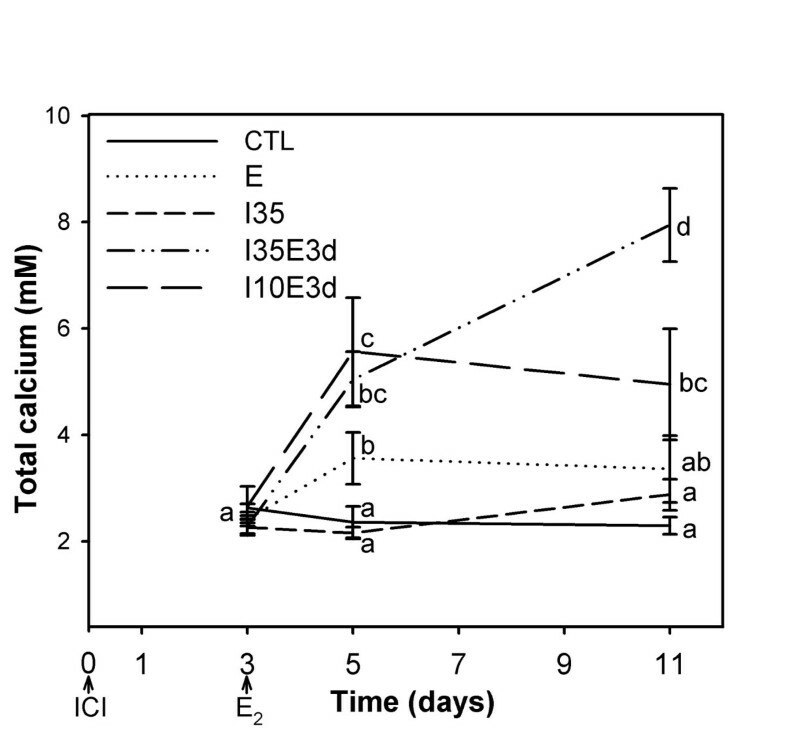 However, in common with tilapia, pretreatment with ICI followed by E2 three days later (IE3d group) caused a statistically significant increase in the plasma calcium levels compared to control fish. A statistically significant difference between plasma calcium concentrations in ICI treatment only and the IE3d treatment group was also observed. Total calcium plasma levels in sea bream. Sea bream males were sampled two days after receiving coconut oil implants containing 1 mg/kg body weight E2 (E1), 0.1 mg/kg E2 (E0.1), 4 mg/kg ICI (I), 4 mg/kg ICI plus 1 mg/kg E2 (IE), 1 mg/kg E2 in addition to 4 mg/kg ICI (IE3d) 3 days earlier, or coconut oil alone (CTL). Each bar is the mean ± S.E.M of the calcium plasma levels (mM) of eight fish. Different letters indicate statistically significant differences (P < 0.05) between treatments, evaluated by one-way ANOVA using log10 of calcium plasma levels. As in the previous experiment, the hepatic expression levels of ERα were significantly increased by both doses of E2 and by ICI alone (Figure 4). Simultaneous administration of ICI and E2 (IE group) also caused a significant increase in the ERα expression levels, although it was not significantly different from that obtained with the same dose of E2 alone (E1). In contrast, in the group pretreated with ICI (IE3d group), ERα transcript levels were not significantly different from the control but differed from the E2 alone group (E1), suggesting an inhibition of the E2-induced ERα up-regulation. Gene expression in E 2 -treated (low doses) sea bream. Semi-quantitative RT-PCR of estrogen receptors (ERα, ERβa, ERβb) and estrogen-responsive genes, vitellogenin (VgII) and choriogenin (ChgL), in male sea bream liver (see Figure 3 for group abbreviations) 48 h following treatment. Each bar (A) is the mean ± S.E.M. of the relative expression values (target gene/18S) of eight fish. Different letters indicate statistically significant differences between treatments (general linear model using log10 of the relative expression values, P < 0.05). The gel images (B) are representative RT-PCR products for each experimental group. For ERβa, no significant differences were detected between the different treatments, although a decrease compared to control was apparent for the lower dose of E2 (E0.1), ICI alone (I) and pretreatment with ICI followed by E2 (IE3d) (Figure 4). Similarly, with ERβb there was a trend for reduction in expression levels in response to all the treatments, with only the combination of E2 and ICI (IE and IE3d groups), significantly decreasing the expression level of this gene compared to the control, and with IE3d also decreasing it in comparison to the E2 only-treated groups (E1 and E0.1). The expression of both VgII and Chg was significantly increased by both doses of E2 and combined E2/ICI treatments, while no change in expression could be detected in the group treated with ICI alone. Strong positive Pearson correlations were found between the ERα, VgII and ChL response (Pearson coefficients 0.466–0.981, P < 0.01) and between ERβa and ERβb (Pearson coefficient 0.679, P = 0.00), while negative correlations were found between the response of ERβb and both VgII and ChgL (coefficients -0.435 and -0.398, respectively, P < 0.05). This study demonstrated that, at least in fish, ICI does not always function as an anti-estrogen since it did not block the effects of an E2 challenge. Indeed, prior administration of ICI potentiated the response to E2. Furthermore, the agonistic response to ICI could also be detected at the level of gene expression and was different in liver and testis. The level of total calcium in plasma is known to correlate with Vg protein and E2 plasma levels in females during vitellogenesis and in males in response to E2 exposure, and it is thus used as a vitellogenesis marker [22–24]. The lack of a statistically significant calcium elevation with E2 treatment alone in sea bream was probably due to the low doses and/or exposure time compared to previous sea bream experiments (>4 days, 10 mg/kg)  and to the tilapia experiment (>48 h, 10 mg/kg). ICI alone did not change total plasma calcium levels or may have slightly lowered calcium within 48 h (Figures 1 and 3), consistent with an antagonistic action. However, pretreatment with ICI synergistically potentiated the hypercalcemic effect of E2 in both sea bream and tilapia. This observation seems to indicate that the initial binding of ICI to ER effectively blocks ER binding to target genes (antiestrogenic action) in the liver, but subsequently E2 triggers a disproportionate agonistic response. Whether ICI acts by stimulating ER synthesis or at the level of ER responsiveness is not clear. In support for the first possibility is the fact that ERα levels in the liver of fish treated with ICI are upregulated and at similar levels to the E2-treated fish. However, it is surprising that ERα levels in E2 challenged fish after pretreatment with ICI are no higher than fish treated with ICI only (Figure 4). Analysis of the early time-course changes in this response is required to clarify the possible mechanism involved. The ERα, VgII and ChgL up-regulation by E2 in liver is in accordance with our previous observations . ERα autoregulation in liver is a common characteristic of oviparous animals [e.g. [29–32]] that has been attributed to ER involvement in the production of egg yolk and egg shell precursors vitellogenins and choriogenins, respectively, in the liver of mature females in response to E2. In contrast to ERα, the regulation of ERβ genes by estrogen is poorly investigated and appears to be much more variable, with these genes being either slightly up- or down-regulated depending on the species and ER subtype [33, 34]. In this study, the expression of both ERβa and ERβb are strongly down-regulated by E2 in liver in the first sea bream experiment, and only slightly down-regulated in the second experiment in which lower doses are used, possibly indicating that their regulation is dose-dependent (and less sensitive to E2 than ERα). These results indicate a differential estrogen regulation of sea bream ERα and ERβ genes in liver and support the hypothesis that the role of the ERβ forms, in the transcriptional regulation of genes associated with reproduction in fish liver is probably less important than that of the ERα subtype and may depend on the life stage of the fish and/or the species. In contrast to the liver, a slight up-regulation by E2 of both ERα and ERβb but not ERβb is detected in testis, suggesting the regulation of ER subtypes varies among tissues, while the up-regulation of VgII and ChgL confirms its recent identification as ERGs in this tissue . ICI mimicked the E2 effects in the liver, up-regulating ERα, VgII and ChgL in sea bream liver, but not in the testis and unlike E2 it did not down-regulate the two ERβ subtypes in liver, supporting tissue- and gene-specific effects for this compound. The simultaneous administration of ICI with E2 did not block the E2 effects on the expression of any of the genes, neither did the ICI pretreatment in the E2-induced up-regulation of ChgL and VgII, suggesting that ICI did not act as an antagonist. However, ICI pretreatment synergistically potentiated the E2 down-regulation of the ERβb gene, while it appeared to have an inhibitory effect on the E2 up-regulation of ERα (Figure 4), at least in the time-frame and doses analyzed (see above). Taken together, these results contrast with the conventional classification of ICI as a "pure estrogen antagonist", which has been reported to block the effects of E2 and some partial agonists (e.g. tamoxifen) with no detected agonistic activities in several in vivo and in vitro models of estrogen action in different mammalian species [reviewed by [11, 35]]. However, some recent in vitro studies have also reported agonistic or partial agonistic activities for ICI [36–40], which appear to depend on the species, the tissue, the ER subtype and the promoter, as reported for other SERMs. The mechanisms in place for the agonistic effects in fish are as yet unknown. Most antiestrogens act through competitive binding to ERs and induction of an inactive conformation of the ligand-dependent AF-2 function of ERs, and their context-specific agonistic activities have been mainly attributed to a tissue- or promoter-specific activation of the ligand-independent AF-1 function or to the induction of a partially active AF-2 conformation . ICI appears to act at several levels to completely block ER-mediated actions (better studied for the ERα subtype), including the competitive inhibition of agonist binding to ERα, the inhibition of ER dimerization, nuclear translocation and transcription activation through both AF-1 and AF-2, and increased ER protein degradation [reviewed by [11, 15]]. While estrogens are known to rapidly down-regulate the ERα and ERβ protein levels in several mammalian cell types but up regulate its mRNA levels , ICI has been shown to cause ERα protein degradation without affecting the ERα mRNA levels , thereby leading to an effective reduction of the ER protein levels. Possible explanations for the partial ICI agonism are: 1) lack of ERα protein down-regulation, as observed in cells of the sheep uterus or in human breast cancer cells; 2) species-specific differences in the N- or C-terminal regions of ERs, which could influence ligand discrimination; 3) ER activation via non-classical mechanisms (e.g. non-genomic actions and indirect activation at AP-1 promoters); 4) ICI activation of other ER subtypes (nuclear ERβ or membrane ERs) or ER variant proteins whose relative expression depends on the cell type or species [36–40]. In addition, it was recently reported that ICI was able to promote human ERα interaction with the CBP/p300 but not the p160 family of coactivators in HeLa cells, although this was insufficient to promote transcription from the pS2 (an ERG) promoter . In fish, unlike in mammals, estrogens have been shown to increase both ERα mRNA (through increased transcription and enhanced stability) and ER protein levels in liver [31, 44, 45]. The ICI up-regulation of ERα in liver detected in the present study could contribute to the observed agonistic effects, and the potentiation effects observed for the ICI pretreatment may be due to an increased responsiveness of the tissue at the time of E2 administration through sbERα up-regulation by ICI. Whether the ERα mRNA ICI up-regulation is followed by an increase in ERα protein level in liver, as occurs with E2, must be investigated in future studies. 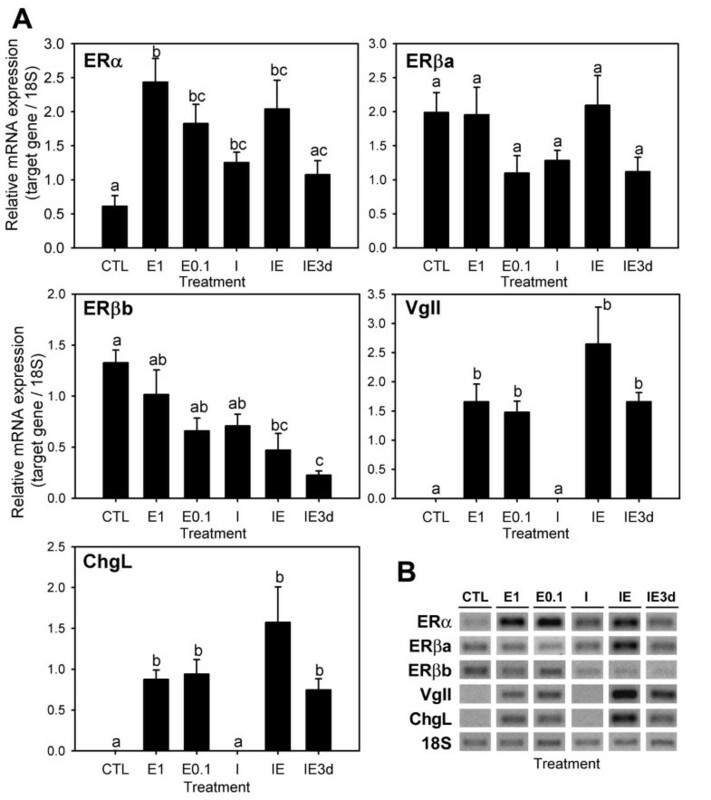 The inability of ICI to inhibit the up-regulation of ERα, VgII and ChgL by E2 in fish liver (Figure 4) could also be interpreted as evidence for an ER-independent mechanism, as suggested for other ICI-insensitive actions [e.g. ]. However, this appears not to be the case, since ICI alone was able to up-regulate these genes (Figure 2) and because the E2-induced transcriptional activation of both ERα and VgII genes have been demonstrated to involve binding of the ER proteins to specific response-elements in their promoters [33, 47, 48], while the stabilization of their mRNAs has also been shown to be mediated by E2/ER complexes . The dependence on ERα has also been demonstrated in some studies reporting ICI agonism in mammals by using ER-specific siRNA . In conclusion, at least in fish, ICI does not always function as an antiestrogen since it did not block the effects of an E2 challenge on several typical estrogenic actions. Indeed, prior administration of ICI strongly potentiated the response of plasma calcium to E2. Furthermore, this agonistic response to ICI could be detected at the level of gene expression and was different in liver and testis. 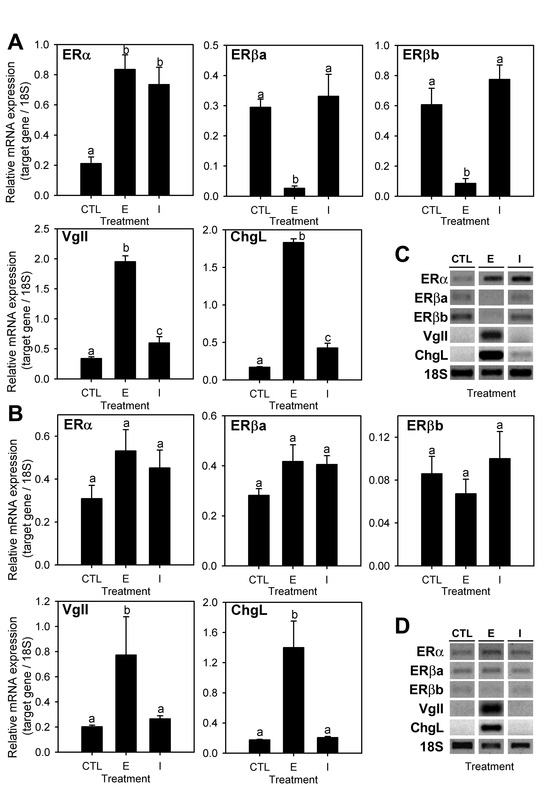 The strong up-regulation of ERα in correlation with Vg and ChgL and the down-regulation of both sbERβs confirm that ERα is probably the most important ER subtype controlling liver gene expression in response to E2. The identified agonistic effects suggest caution in the use of ICI as a pure antiestrogen to "knock-out" estrogen functions in fish, at least until their effects and mechanisms of action are better characterized. It would be also interesting to investigate the effects of other "pure antagonists" such as ICI 164,384 and RU 58668 on the estrogenic actions analyzed in this study. This research was funded by European Social Fund and National funds under Portuguese National Science Foundation (FCT) project POCTI/CVT/39355/2001. PISP and PBS were in receipt of FCT fellowships POCTI/SFRH/BD/5198/2001 and POCTI/SFRH/BPD/3567/2000, respectively. We thank Dr. J. Fuentes and N. Kolmakov for their help with fish manipulation and E. Couto for carrying out the radioimmunoassay. PISP planned and carried out the sea bream experiments, some of the RT-PCRs, gene expression quantification, statistical analysis and discussion of results, and wrote the manuscript. PBS and JBC planned and carried out the tilapia experiments and calcium measurements. HRT carried out RNA extractions, RT-PCRs and calcium in the sea bream experiments. DMP participated in the discussion of results and wrote the manuscript. AVMC devised the study, participated in the planning of all experiments, statistical analysis and discussion of results, and wrote the manuscript. All authors read and approved the final manuscript.